A straight razor demands respect; take care of your tools, and they will take care of you! With proper maintenance, a quality straight razor can last several lifetimes. The more you use your razor, the more important routine maintenance becomes. Besides stropping and honing, oiling your razor is an important step to consider in protecting your razor’s longevity. When developing our Cascade Steel straight razors, we reached for modern materials with superior edge retention and stainless properties, which means frequent oiling would be redundant. Unfortunately, for 200 years the best razors were made with high-carbon steels. High carbon steels get incredibly hard and sharp, but can rust if water even enters the room! Since wet shaving is inherently--well, wet, rust prevention is an important step for a majority of straight razor users. This includes those using vintage straight razors and razors by Portland Razor Co. made with O1 high-carbon tool steel. In this article, we review some of the best and worst oils for straight razor rust-prevention. Refined camellia oil (also known as tea seed oil) is a fantastic all-around razor oil. It is a light, skin safe, colorless oil with low viscosity which does a good job of displacing water and is easy to apply. Provided it is well refined, it shouldn’t resinify or spoil. Mineral oil is a widely available and very effective razor oil. Low to medium viscosity, skin safe, safe for scales materials, does not resinify, won’t spoil, petroleum product. Ballistol is marketed as an eco-friendly alternative to petroleum products like mineral oil and WD-40. It is skin safe, biodegradable, low viscosity, aerosol. In general, Ballistol will not resinify, however we have encountered a few instances where it reacted negatively with other oils and became sticky. WD-40 works, but keep it off your skin and scales. We like it because there’s a good chance you already have some at home! The “WD” literally stands for “Water Displacement,” and it does that job really well. It also contains solvents which help break up old grease and rust but can be harmful to scales. It is not listed as a known carcinogen but is irritating to some when in contact with the skin or if fumes are inhaled. For these reasons, we wouldn’t recommend it as your go-to razor oil, but it works in a pinch or if performing a restoration of a razor with lots of build-up on it. Yes, you can prevent rust with olive oil! But, should you? It has medium viscosity, it displaces water, you probably have some in your kitchen, and it is obviously skin and food safe... It can also resinify fairly quickly and will go rancid over time. You should avoid any culinary misadventures in the bathroom by using olive oil (or any other cooking oil) to prevent rust only in emergencies. You can do a lot of things with petroleum jelly. Sure, you can slather it all over your straight razor and successfully keep it from rusting… but please don’t. The goopy stuff sticks well to your straight razor to displace water, but it attracts and holds everything else it might come into contact with such as dirt or hair. It’s very much a bummer to clean off as well, requiring soapy water or solvents in all the razor’s nooks and crannies (which is exactly where you don’t want water and solvents!). Cleanup is an important consideration since removal of oils is a necessary step prior to honing to keep contaminants out of your expensive water stones. We hope you found this review of razor oils helpful! Did you learn something new? Do you have a question about razor oils? Leave it in the comments below! If you are ready to take the next step in learning to care for your razor, consider signing up for an upcoming honing and maintenance class. There you will have the benefit of hands-on instruction with a Portland Razor Co razorsmith for more specific and nuanced guidance. We gave customers the option to paste the inside of their prep strop several months ago and the response has been overwhelmingly positive. If you are on the fence, here is what you need to know about pasted strops. What does "Pasted" mean? A pasted strop has had an application of very fine polishing abrasive, in our case: chromium oxide paste. This is applied to the inside panel of the prep strop and allows for more aggressive stropping action to prolong the life of your razor's edge. How often should I strop on paste? We generally strop our razors on paste every 10-15 shaves, or whenever you notice that your razor is not shaving as efficiently. Do I need to reapply paste? When we apply paste at our shop, we generally apply more than an individual shaver should ever need for their own use. That said, if you notice that the paste has worn away or is no longer doing its job, it may be time for a reapplication (but more likely, it is time to hone your razor). How do I apply paste to my strop? 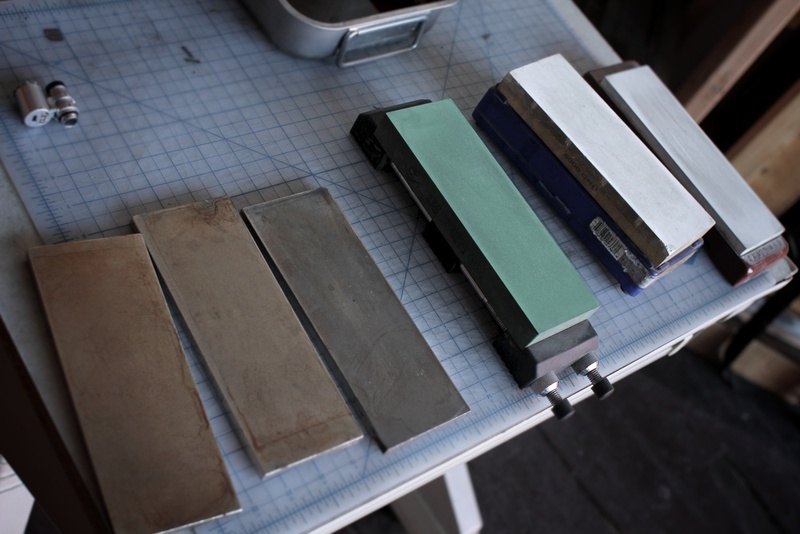 We offer a one-time application for $5, but there are several other types of abrasives you can purchase and apply to your strop: powders, sprays, and wax pastes. We prefer the wax pastes because they are easy to apply and go a long way, simply color in the part of your strop you'd like to paste just like you would with a crayon. Where do I find chromium oxide paste? Check with your local hardware store to see if they carry chromium oxide paste, just ask for "green jeweler's rouge" or "green buffing compound." If you can't find it locally, there are plenty of quality sources from online knife-making stores to Amazon. Portland Razor Co. blades are made of 01 tool steel, a high-carbon steel with excellent edge retention, workability, and good corrosion resistance. It is not, however, a stainless steel and requires some special care. Keep your straight razor clean and dry between uses. Strop it well between uses. This keeps the edge keen, and clean of debris that can cause corrosion on the blade or irritation on your skin. For long-term storage, apply a very thin coat of light oil (camellia is recommended) or Ballistol and wipe off the excess. Store in a breathable/moisture-wicking container. PR has nice merino wool sheaths available for purchase, but a sock will do! Do not store straight razors in a leather sheath long-term. Using your straight razor regularly is the surest way to make sure you are cognizant of its condition. Inspect yours frequently to assure that it is always ready to perform! Finally, store your straight razor out of reach of children. Below are a few simple do's and don'ts for safely handling straight razors. This is by no means an exhaustive list; you are ultimately responsible for learning to safely handle your own blade, so take it upon yourself to become familiar with safe practices, and use them consistently. Above all, use common sense. Handle your razor with extreme care and control. Keep your razor folded/sheathed when not in use. Fold/Sheath your razor before handing it to someone else, or if you must change focus for a while. Keep your razor dry, clean, and sharp. Shave in a well-lit room free from distractions and other hazards. Try to catch a falling blade. Use your razor for anything other than shaving hair. Test the edge with your finger! The safest way to test the edge's sharpness is with the "shine test" or the "hanging hair test." Let water or lather rest on the blade longer than is absolutely necessary, moisture on the blade will cause it to rust. Not a safety issue, but definitely a buzz-kill. If you have never held a straight razor before, or are still inexperienced using them, we recommend you practice simply holding it. Open and close it until you feel comfortable you can perform this operation safely 100% of the time. Then, try a few different grips and manipulate the blade in one hand as if to shave. Remember that dropping the razor can damage the edge or scales and should be avoided.